Dr. John Wesley Russell was born in Kerwood, Middlesex County on the 25th of August, 1876. He was the 4th of 6 children born to John Russell and the former Hester Ann Kerr. His father was a Methodist Minister. His siblings were; Mary, Elaine, Hattie, Jean and William. 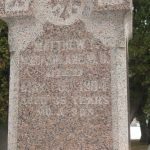 Dr. Russell’s family lived in a number of locations, including in the City of London, Usborne in Perth County and the small community of Springfield in Elgin County. Dr. Russell graduated M.D. 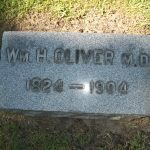 from the University of Western Ontario in 1901 and opened his medical practice in Highgate. Dr. Russell was living in Highgate when he married Mabel Ethel Millar on the 25th of December, 1906 in Saginaw, Michigan. Mrs. Russell was the daughter of Peter Millar and the former Calista Roseberry. According to the 1871 census, (prior to Mrs. Russell’s birth), Peter and Calista Millar lived in Bothwell and her father was a lumberman at that time. The 1871 census and other records list some of her siblings including; Stephen, Able, Josephine, Frank, Emma, Joseph and Myron. The 1903 Saginaw City Directory in Michigan records that Mrs. Millar was widowed and she lived at 1211 S. Weadock Ave, with a number of her children, including Mrs. Russell who was single and a teacher at Emerson School, in Saginaw. Dr. and Mrs. Russell had a daughter, Mabel Lois Russell born to them in Highgate on the 28th of September, 1907. Eventually Dr. and Mrs. Russell moved to Toronto and resided at 1084 College Street. They had two more children, John Fletcher Russell and Beryl Russell. 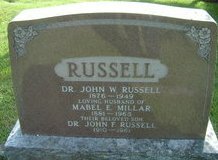 Dr. Russell died in 1949. Mrs. Russell died in 1965. They are buried at Park Lawn Cemetery in Toronto. *Dr. Russell’s brother William became a physician/surgeon and practiced in the Toronto area. Dr. Russell’s son John also became a physician.